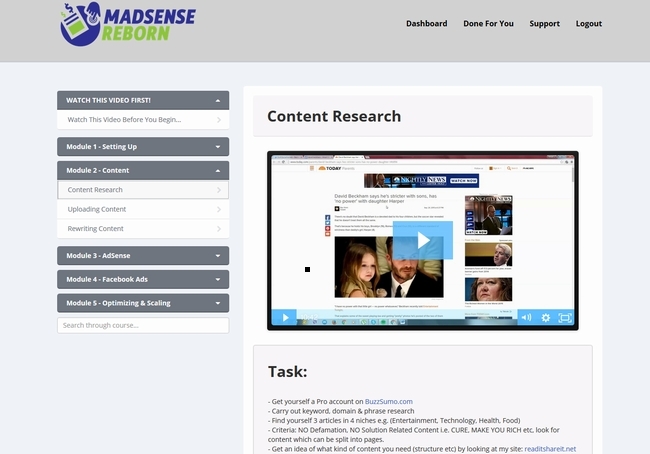 Today Im taking a look at a new training program called MadSense Reborn. 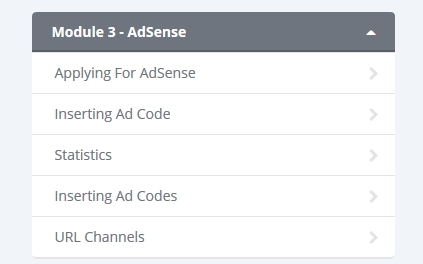 MadSense reborn is a mildly clever name for an Google AdSense training. AdSense itself has a lot of appeal for new marketers. Its a very old and proven platform which is run by one of the most trusted online giants in the world (Google). Its simple to set up, simple to use, and you get paid for every click you get on the ad. This has a big advantage over things like affiliate marketing. With affiliate marketing you only get paid when an actual purchase is made. Even with something like CPA, you only get paid when the site visitor takes a very specific action (which often includes providing their email or signing up for a trail for a paid service). However with AdSense you get paid just by them clicking the ad. They dont need to buy, they dont need to optin or signup, they simply need to click the ad and you get paid. Nice and simple isnt it? Now honestly I never thought much of AdSense though. Generally your only going to get paid a few cents per click. Perhaps even as much as a dollar. Once in a while you may get paid a few dollars per click depending on your niche. But either way I never really thought of it as a lot of money. Though to be fair, I also was not considering the fact that its a lot more easy to clicks than it is to get people to actually buy so your likely to get many more clicks than actual affiliate sales. Either way though, in my online business I largely dismissed AdSense. Sure I knew it was a proven model run by a trusted company, but I just always thought of it as ‘the old way that does not really pay that much these days’. Because of this when the vendors of MadSense asked me to look at their training I was really skeptical as to if it was even worth looking at in the first place. Being that I actually test software and actually go through the training that I review deciding to test a particular product is a fair amount of commitment for me. For a training product like MadSense the first thing I need to know before I commit myself to the time it takes to go through the training personally is that the methods it teaches are actually viable, functional, practical scale-able and most importantly repeatable ( I personally hate it when someone does one thing one time makes a couple of bucks then suddenly thinks he is a guru who needs to train people). Because of this, before I even started looking at the training I needed the vendors to prove to me that this was something that fits these criteria. Initially they refereed me to some pre-made proof screenshots and a video showing an AdSense account. Unfortunately for them that was not going to cut it for me. I needed to see live proof, I also needed an explanation as to how this works, why it works, how long they had been doing it, how they started doing it, etc. In short I wanted their entire story about how this product came about and also multiple proofs that it really works. Over the course of two days I asked for screenshots, videos, and explanations. I really grilled these guys and at one point I almost thought they where going to tell me to just piss off. I really gave them a lot of grief with proving to me that this works. In truth the reason I did so had little to do with them and more to do with my preconceived prejudiced against using AdSense for monetization. However after two days, despite all the hoops I made these guys jump through, they finally convinced me that what they are doing is real, viable and repeatable and I agreed to go though the training. Knowing the tactics work is only 1/2 of it after all, the training still has to teach those tactics well. The training is made up of 5 main modules and a ‘welcome module’. The welcome module thank you for joining their program and of course tells you about the awesome webinar that they are running for free (where I have no doubt that they will be both giving good information and trying to sell you something). I skipped the welcome video and went right into the main modules. Each module is made up of several different videos which range in length from about 7 – 18 minutes. The training videos themselves are not full of fluff. They don’t make you watch some fancy intro animation at the beginning of each one and they don’t waste your time. They are clear cut, to the point and thankfully named something relevant to their content so you can revisit specific topics later if you need to. While the videos are not full of filler content they are still quite detailed. The MadSense training starts off fairly slow, it does not assume that you know anything, and it takes you from the ground up. All you have to do is follow the instructions and do what are are told (and shown). I also found it really appealing that the teacher in the MadSense training not only shows you things, he takes the time to explain why they are done a particular way (without rambling on for hours though thankfully). Finally to make it truly step by step instructions at the end of each video there is a task list that summarizes the videos highlights and gives you a action steps that you should take before continuing on with the training. I thought this was a nice touch. Really it cant get more ‘step by step’ easy to follow than this. So what do I think of MadSense Reborn? Well, first I made them convince me that this was real, viable, and repeatable, which they did. Then I was pleased to see that the training is well done and full of step by step actionable content. Honestly I think this is a great system for anyone just getting started. Truth be told if your already established and making money online with something like affiliate marketing or CPA etc you probably would not want to take a 90 degree turn and start doing something totally different. However if your just getting started and have not yet made decent money online this is something that I feel very comfortable suggesting you consider investing in. BONUS: I negotiated a very special (and massive) bonus package from the vendors for anyone who picks up MadSense though my link. You will get everything listed below (right inside of JVZoo). Upselled hard, this one ? We would need a website first, then a good niche ? Yes your going to need a niche for anything regardless of what you do online :). Yes you will need a website for this, otherwise where would you show the AdSense ads. No idea what “Upselled hard, this one” means, but yes Im sure there are upsells and yes as always they are 100% irrelevant. Brett, sure would have been nice to know we need to purchase a $59.00 Theme. Any work around for this? You dont need to purchase a $59 theme. There are a billion free themes in the WordPress repository. The vendor suggests the theme he uses just because that is the one he uses and he wants to give you the exact steps he took. Be assured though that you don’t need that specific theme, any decent looking theme is going to be fine. Sorry, still trying to figure all this stuff out. Within reason, will a lot ot the settings he shows in the training be the same for all themes? And would or could you suggest a few themes that might be good for this product. Thank you again for your reviews. VERY HELPFUL. on the sellers Facebook page they supply a free version of the suggested theme. Works fine on hostgator – but a couple of people had problems with it on other hosting. so I didn’t hear you say anything about your earnings? I guess you haven’t made any??? I’m always skeptical when I see 20 google pages of people promoting a product and not a word of how much if any have they made?? You did not see me say anything about my earnings because I did not use this to make money, I made the vendors go through several additional steps to show me it works for them and others, and I reviewed the training for quality, that is all ever claimed to have done. I never said I used this. In fact if you read the review you can clearly see me saying “Truth be told if your already established and making money online with something like affiliate marketing or CPA etc you probably would not want to take a 90 degree turn”. This does not just apply to the people reading this it applies to me as well, I am established doing something other than AdSense and it makes no sense for me to start doing something totally different, which is why I did not even try to make money with this. With respect a good way to get over being skeptical is to actually read the articles that people write. Some of us are actually honest and upfront. I’m wondering if you need a product to do this? Is it for affiliates? Where does the money come from if not from your own products or affiliate commissions? Thanks for the help in advance Brett. Brett, you have a knack for finding the gems. I am no newbie, having been marketing online since 1992. I’ve made and lost fortunes! I made a killing on Amazon, but started looking at your methods last year as Amazon dies off (or gets taken over by China). You consistently find good and decent products. I have probably purchased 3/4 of what you approved for sale. Thanks for doing the leg work to find this stuff! It’s much appreciated. Brett… Buddy!!! ONE HUGE thing you should add to your review video. Take if from me.. I’ve been around a long time! I have over 30 websites and dozens of themes. But the tutorial on the theme ALONE is worth more than the price of this offer! I would have paid the money just for the tutorial on this theme – regardless of the rest! I think that for newbies, this would be a MONSTER benefit! Very nice stuff! If I understand rightly, we set up a site and test viability with Facebook $5 boosting before going all in. But I noticed you didn’t do the usual pros and cons on this one. Might one downside be that the site may not pan out as a money maker in testing. And it could well take multiple campaigns to find a winner? This could be somewhat expensive. Although with this method I don’t think having .com domains would be necessary; less costly .info or .xyz domains would suffice I think, which would keep the cost down some. Am I off base here? Your over thinking me not doing the pros/cons. In fact if you read one of the first comments, you can see a guy who asked why I did not do a star rating. The reason I did not do a pro / con was the same because Im updating the sites functionality and cant use that feature of my theme until Im done. I dont think you need a .com at all given that your using paid traffic. It really does not matter. If you bought through my link then the bonus is inside of JVZoo, when you view your receipt, you will see a button for it (if I recall correctly its a blue button). I bought the front end product through your link but is undecided about the upsells. Appreciate your comments on these upgrades. Thanks. I do not review OTO’s sorry.Its not possible for me since unlike most people I actually spend a lot of time going through the FE products when I review them. and instead of adsense use CPA offers? Is that a viable option? so it would be nice to have other options available. I know some people who run into problems with CPA as well. In fact I know people who have run into problems with almost everything, when they did not follow the rules. I guess you can use CPA instead of AdSense, but honestly if your first thought when learning about a training is to do something other than what the training teaches it sounds like you don’t really want to be taught.